This year has seen plenty of news about Facebook expanding its original video offerings into a service that can compete with the likes of YouTube, Amazon, and Netflix. Now, the social network has announced a new platform that could bring those ambitions ever closer. In a blog post yesterday, the company announced the rollout of Watch, a service that will show video content “produced exclusively for it by partners.” The Watch tab and a number of shows will start arriving on some US users’ mobile, desktop, and Facebook’s TV apps today. With Facebook running out of space for its ads on the news feed, the company has been looking for other sources of income. Those who create content exclusively for Facebook will earn 55 percent of the revenue generated by the mid-roll advertisements inserted into the videos. Facebook wants to make viewing videos a social experience. 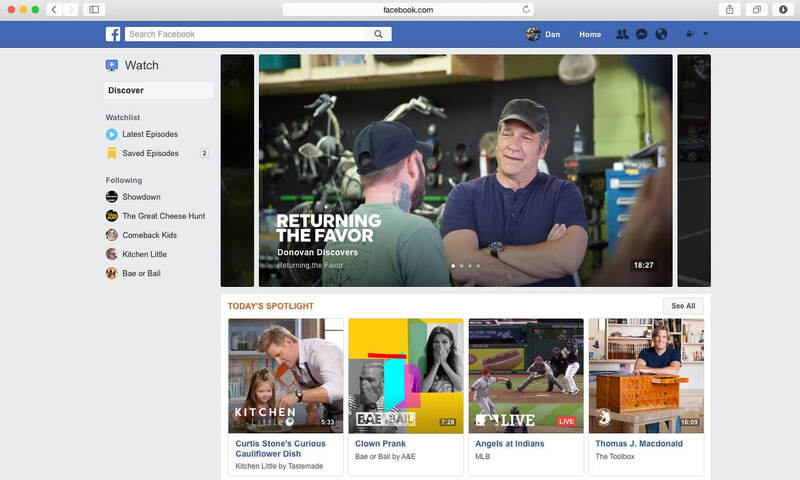 While watching the shows, users will be able to see comments and connect with friends and other viewers, or participate in a dedicated Facebook Group. “Watch is a platform for all creators and publishers to find an audience, build a community of passionate fans, and earn money for their work,” said director of product Daniel Danker. One of Facebook’s original shows is Nas daily, which consists of one-minute travel videos from the vlogger. Other programs include a cooking show featuring kids, a Major League Baseball game once per week, reality shows, documentaries, and a program hosted by Mike Rowe that rewards people who’ve done “something extraordinary” for their community. There’s also a live program featuring motivational speaker Gabby Bernstein, who will answer questions from Facebook users. There are no content restrictions on swearing or violence, but it will be possible to flag shows. The big video providers are unlikely to be worried about Facebook’s platform at this early stage, but with a potential audience of two billion and the social elements it offers, Watch could eventually grow into a real competitor.